Kaser, G., I. Juen, C. Georges, J. Gomez, W. Tamayo (2003). 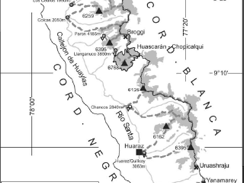 "The impact of glaciers on the runoff and the reconstruction of mass balance history from hydrological data in the tropical cordillera Blanca Peru." Journal of Hyrdrology282: 130-144. Paper starts off with the typical description of increased water consumption and the dependance of glaciers for that runoff. -Very little work has been done investigating the hydrology of glaciated tropical catchments. -During the dry season the runoff is highly dependant on the glaciers of the region. -The glaciers have very little layering so impermeable ice layers, dust layers, and density changes in the snow pack are usually missing and because they are steep and crevassed hydrological data seem to be a good tool to look at mass balance variations rather than in situ measurements like usual. -Runoff and precipitation data was available but lacking for some years (past 1994). Looked at data for 10 catchment areas determined by SPOT satellite data. -Analysis of air photos from a previous study show that glaciers were about 11% smaller than the initial inventory done with the photos and further analysis shows the glaciers have lost about 8% of their surface area from 1948 to 1990. -In contrast to the midlatitudes (PNW) where temps reduce runoff in winter and increase runoff in spring and summer due to snow and glacial melt, runoff and melt has a “smoothing” effect in the tropic. What is meant by “smoothing effect”? -If no human influences or swampy areas affect the runoff regime, any deviation from the precipitation cycle is due to the glaciers so the mass balance history can be reconstructed from available hydrological data. -Based on the reconstruction there was a mass loss between the 50’s and 60’s followed by a marked gain between 1970 and 1975 but since then the area has been dominated by mass loss. -In the region there are very strong negative mass balances during El Nino periods because the area is highly affected by ENSO. This paper was interesting and could serve as another reference for the importance of glaciers for runoff during dry seasons. The climate is very different than the PNW but it is also affected by ENSO. I think a lot of our water supply is due to snow melt and water retention within the rocks of the high cascades (high water retention time) resulting in springs and sometimes year round stable river flow (like Sahalie Falls). But there is a lot of flow from the glaciers as well, just not as important here as in very low tropical latitudes it seems. Also, it was cool that the mass balance was reconstructed from hydrological data because in situ measurements couldn’t be done like they can here. Kaser, G., 1995. Some notes on the behaviour of tropical glaciers. Bulletin Institute fr. e´tudes andines 24 (3), 671–681. Patzelt, G., 1985. The period of glacier advances in the Alps 1965, to 1980. Zeitschrift fu¨ r Gletscherkunde und Glazialgologie 21, 403–407. Porter, S.C., 1986. Pattern and forcing of Northern Hemisphere glacier variations during the last millenium. Quaternary Research 26 (1), 27–48.